here because you crave exciting Horror, Sci-fi, and Adventure escapism reads. Well, book lover, you’ve come to the right place. Nixion ordered all future such weapon research and the destruction of all U.S.
Nixon to act so decisively. with crops grown from a new experimental seed. It is the beginning of a great tragedy. Agriculturist Ronald Huntly retires from the Army . of the grasshopper menace to mutate into carnivorous killers. whole town is savagely attacked, the governor requests the US ARMY to intervene. 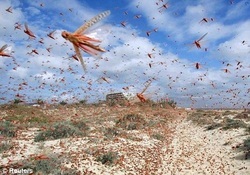 it is soon learned their orders are to eradicate more than mere insects. loves, and despite the awesome might of the U.S. Government conspiring against him.